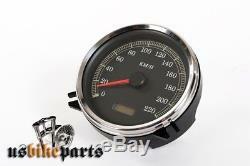 Electronic meter from 1995 harley-davidson softail dyna road king. Different parts to screw on. Right of withdrawal of 31 days. All the coins offered are in stock! Shipment immediately upon receipt of payment. We will be happy to advise you personally. O our products are new and made exclusively from new parts! High quality electronic meter for harley-davidson, the meter has a black dial up to 220 km / h and an LCD display for total mileage and daily mileage. A "check engine light" is integrated additionally to the meter. The diameter of the meter is 11.5 cm, depth 4 cm without plug-in device and 6.5 cm with plug-in device. Pay attention to the connector, or photo, before any purchase. The connector measures 3.5x1.5 cm. 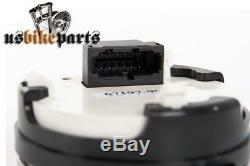 For road king '95-'98 and softail '95-'98 the adapter hd-nummer 67418-99 is necessary! Larger items will be delivered with DHL.